Santa Llúcia, by the way, was a Sicilian martyr of the third century. The medieval legend says she was subjected to a trial in which she was punished and they took her eyes out, but miraculously she kept watching. That is why she is the patron saint of the blind and people with sight problems, together with the dressmakers and tailors, among other professions. Her festivity is celebrated on December 13. This year the fair of santa Llúcia celebrates 225 years! 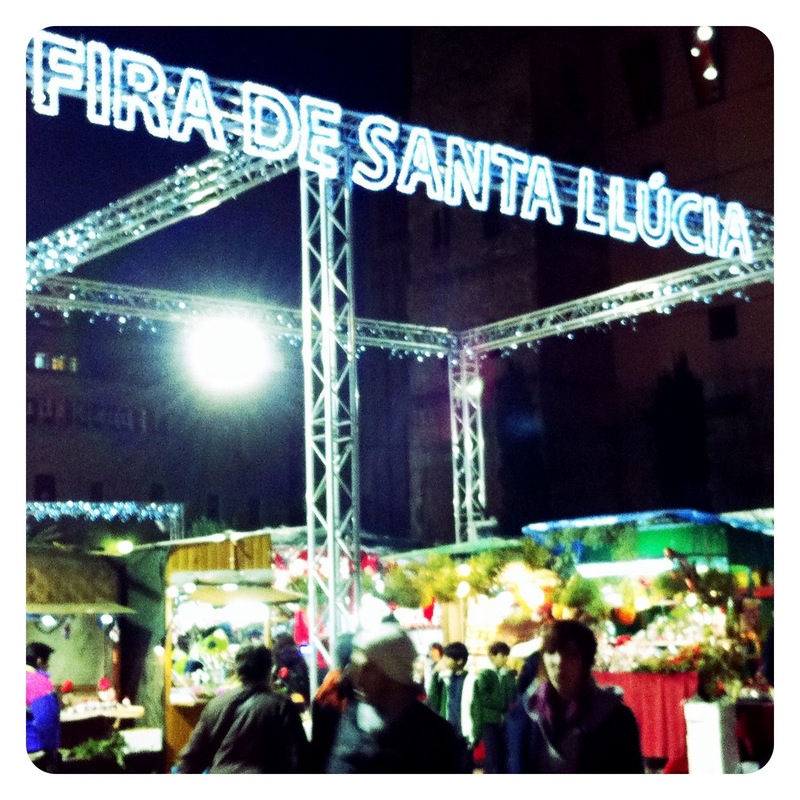 It is one of the most deeply rooted and ancient Christmas traditions in Barcelona, ​​documented since 1786. In fact, years ago there were several fairs, with stalls placed together by type of goods sold. Over the time, however, they were united into a single one, and currently there are about 270 stalls altogether. All the inhabitants of the city, of every social class, visited the fair sooner or later. It is said that it was a good place to arrange weddings! For those who have not been there yet this year: it will be open until December 22, from 10:30 am to 8:30 pm. When the fair closes we will have to go to the one that is held at the Gran Via. Contrary to what many people think, the Born market has not always been under construction! 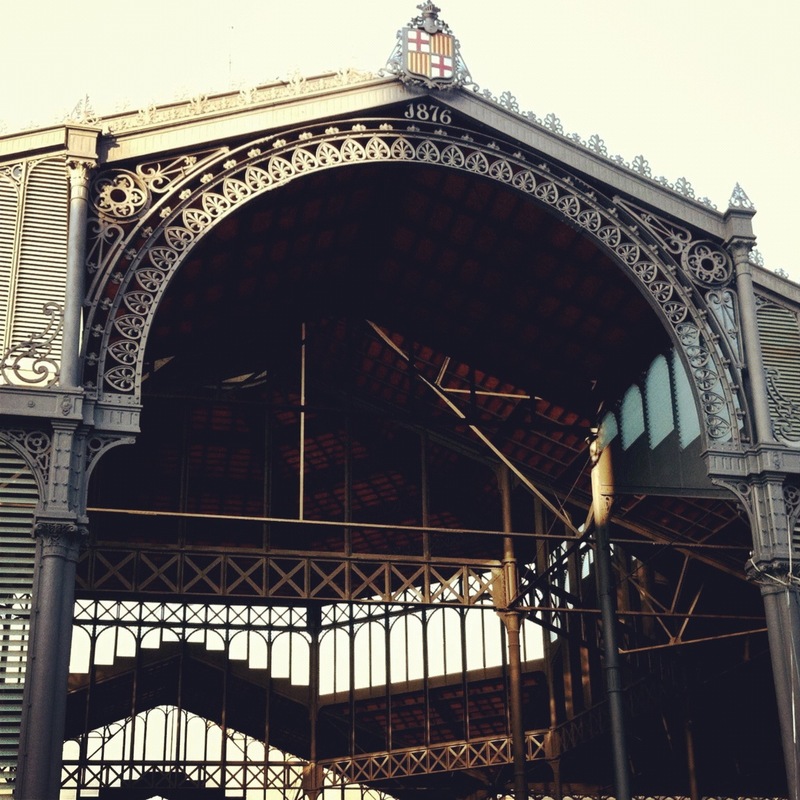 Actually the building was completed in 1876 and it is, along with the San Antonio market, the main example of iron architecture in Barcelona. This was a popular architectural and construction trend of the second half of the nineteenth century, and arose thanks to the availability of new materials as an effect of the Industrial Revolution. After the demolition of the citadel and walls of the city, Barcelona needed a market for the supply of fresh produce, mainly fruits and vegetables. The Born market was a very modern building: quite large, under cover and ventilated. This market was in use for a century, until Mercabarna opened in 1971. The location of the Born was obsolete and there was a need of a new market, more powerful and far from the city center. And so the emblematic building of Born was left abandoned for 30 years, while someone figured out what to do with it. Finally it was decided that it should serve as the main building of the Provincial Library in Barcelona, ​​but the discovery of some remains of the medieval and modern city made the works stop. If everything goes as expected, it seems that in 2012 a cultural center will open there, and it will include the archeological site and a display of the War of Succession and the subsequent loss of freedoms of Catalonia. That would be great, but it is a promise that has been progressively delayed since 2005, so I have some doubts about it. I start to think that those works will be forever! Every year, a couple of weeks before the festivity of All Saints (November, 1st), stalls selling chestnuts and sweet potatoes are settled in the streets of Barcelona. They are with us until well after Christmas and Epiphany. 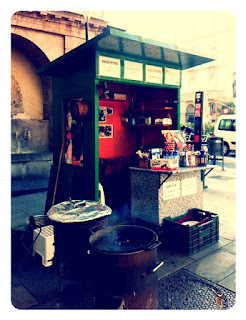 In fact, selling chestnuts in the streets of Barcelona is an ancient tradition. There is evidence that in the late eighteenth century there were over two hundred stalls stops on the streets of Call, La Boqueria and Hospital. Many of us imagine the figure of chestnut sellers roasting chestnuts in front of the fire, warm enough, giving us a cone made ​​of newspaper, full of steaming chestnuts. They are energetic fruits that are supposed to help us beat the cold. Finally, if winter ends up showing up and you feel like eating chestnuts, there are twenty-eight stalls scattered around Barcelona. You can even see their location on the website of the City Council. After all, they are and have always been part of our landscape! Remember the whale Ulisses? Together with the gorilla Floquet de Neu (Snowflake), he was probably the most famous inhabitant of our zoo. 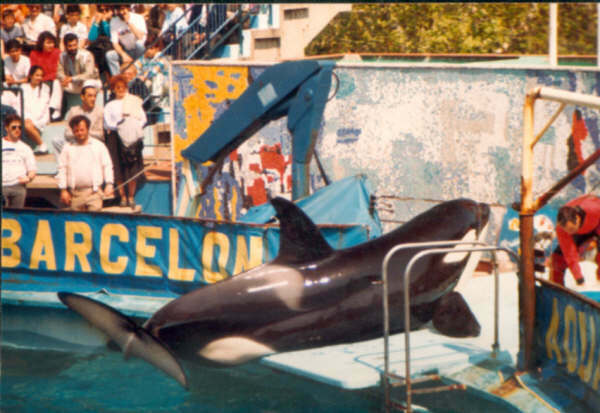 Actually his fame soared when someone told us that he had become too big for the aquarium and the zoo of Barcelona, and he had to be moved to another location to prevent him from suffering. It was the year 1994 and the transfer was thoroughly prepared; it was followed by thousands of people on huge screens and broadcasted live by TV3. Everything was settled to make sure he had a nice trip to Sea World in San Diego, California. Well, what has happened to our most beloved killer whale after all this time? Now Ulisses is 30 years old and is a little chubby (he has gained around 1300 kilograms since then). He recently became the father of a little whale (150 kilograms at birth) called Moana and born after in vitro fertilization. It turns out that the poor Ulysses has not been able to meet his daughter, who was born in a French aquarium. Something that seems to be certain is that Ulysses will never come back to Barcelona. 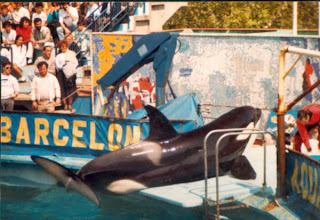 The agreement that was signed with Sea World stated that he and half of his offspring would return to Barcelona. Of course that was signed when it was thought that at this stage we would have a marine zoo big enough to accommodate a killer whale, which currently does not seem to be happening in the near future. 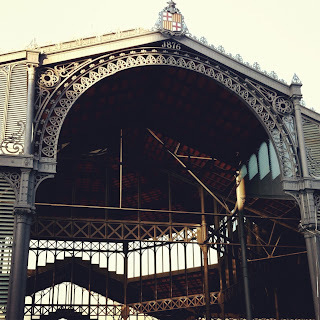 Continuing with the subject of the previous post, today I am writing about another place where the people from Barcelona usually meet (if we are able in the middle of so many people) when we go to the city center. It is, of course, the fountain of Canaletes. Formerly, when the city was still walled, there was a water fountain at the top of La Rambla, that brought water from Collserola. This source, which at first was inside a building, was at some time diverted, flowing thus outside, and it was very crowded with people coming from the whole city. The water was coming down a drain (canaleta in Catalan, and therefore its name) to a trough, and it was considered of a very good quality. So the locals queued to take some home, the same way that it happened and still happens in many towns. Today the water from the fountain is not particularly good, it is supposed to have other properties. Tradition says that whoever drinks from the fountain comes back to the city. 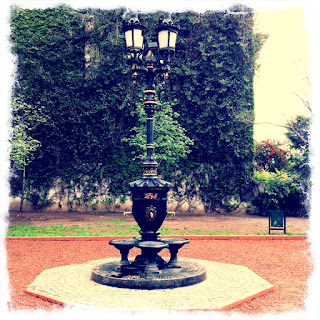 The current fountain of iron, with four springs and a lamp on the top, is not unique. This is a design made ​​for the Universal Exhibition of 1888 and there are currently more than 15 distributed around the different districts of Barcelona. We can also find some outside the city, and even quite far away. This one on the picture, for example, is 12,000 kilometers away. Specifically, in the Plaza de Barcelona, of Buenos Aires, Argentina. A fountain from which, just in case, I drank! Let's meet at the Zurich! This is one of the most usual sentences among the locals! And this is the ritual: you get to Plaça Catalunya by underground or railway, go up the stairs and see if you are the first to arrive. If you are, and you have to wait, there is nothing to worry about: waiting couldn't be more fun. The Zurich is our cafeteria, and has been forever, and it is been like that for so long that we often take it for granted. Next year it will be 150 years since its opening as the bar of a train station, the liner that went up Balmes street, although ti was then called la Catalana and was a kind of kiosk that gave service to travelers. During this century and a half, it has stood there, witnessing the beating heart of the city. Demonstrations, rallies and celebrations, assaults and persecutions, building works and alterations, recordings and concerts, even wars. But above all, people arriving. People waiting. People looking. People finding people. People getting there and away. Above all, people.